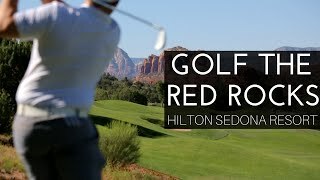 Welcome to the Hilton Sedona Resort at Bell Rock. As you enter the resort you are greeted by a hanging sculpture that resembles the quartz crystals found throughout the area. The furnishing, color palate, and art pieces where selected to reflect the region as well as evoke serenity, reflection, relaxation and to inspire. The resort's amenities include three sparkling swimming pools, adjacent 18-hole championship golf course, three lighted tennis courts, 2,500 sq. ft. fitness room, CrossFit style course, over 30 scheduled fitness classes each week, indoor and outdoor patio dining. The resort's mostly suite accommodations boast balconies and patios, microwave ovens and small refrigerators. The resort is nestled amidst the grandeur of Northern Arizona's red rock country. The resort is conveniently located near fine restaurants, shops, hiking and mountain biking trails. The redesigned lobby is infused with natural elements that reflect the destination. The resort boasts mostly suite accommodations and three sparkling swimming pools. The Hilton Sedona Resort is family and pet friendly. Offering over 170 suites with living/dining area, micro wave oven and refrigerator, two LCD televisions and a balcony or patio. Enjoy the kids friendly two tiered Cascades Pool. Outdoor games and board games available. Enjoy the resort's two tiered Cascades Swimming Pool. Grab a snack or lunch at the Blue Water CafÃ©, the resort's seasonal outdoor restaurant. The resort provides many opportunities to spend time with the ones you care about. Sedona is for adventure seekers. With more than 200 miles of mountain biking and hiking trails there is plenty to explore by bike, by foot or by Pink Jeep. 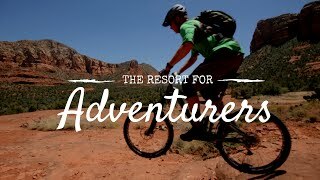 Sedona offers an array of exciting recreational activities. With over 200 miles of hiking trails you can choose the perfect hike. There are mountain bikes trails available for all skill levels. Take a Pink Jeep Tour, one of Sedona's most popular activities. 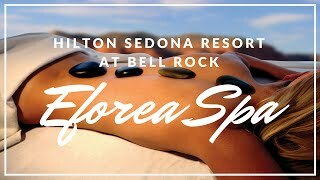 eforea Spa at Hilton Sedona is a place like no other where you can reconnect with self and emerge brighter. eforea treatments have been specially designed to introduce guests to unique, unexperienced techniques that are both internationally and locally inspired. Eforea Spa at Hilton Sedona is a place like no other where you can reconnect with self and emerge brighter. Eforea treatments are designed to introduce guests to unique, unexperienced techniques from the most fabled spa cultures around the world. Hilton Sedona Resort's Athletic Club offers; a 25-meter lap pool, 3 lighted tennis courts, aerobics room, over 30 scheduled fitness classes, 2,500 sq. ft. fitness room with free weights and a outdoor CrossFit style course. The Club has changing rooms with sauna, steam room, whirlpool and showers. The Club features a CrossFit style Warrior Pit. 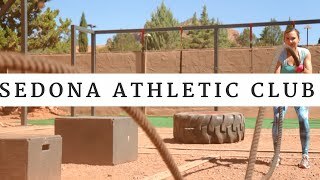 Sedona Athletic Club offers three lighted tennis courts, fitness classes and 2,500 sq. ft. state of the art fitness room. Swim some laps in the Clubs 25 meter lap pool or enjoy a cocktail pool side. Play a round of golf at the adjacent Sedona Golf Resort. No other Sedona golf course provides a better combination of jaw-dropping splendor and exceptional challenge than the acclaimed Sedona Golf Resort. Located in the heart of one of the most captivating regions of the Southwest, the thrilling 6,646-yard, par-71 course is widely considered among the world's most unforgettable golf experiences. Winding around the famed red rocks of Sedona, each hole provides a unique adventure. The adjacent Sedona Golf Resort course, designed by Gary Panks, is both visually stunning and challenging. Sedona Golf Resort's 10th hole is one of the most photographed Par 3 in the Southwest. PGA Professionals are on staff for lessons and clinics.